MITZPE RAMON, ISRAEL–Today Will and I drove south, east and north to meet Dr. Yael Edelmen-Furstenburg of the Geological Survey of Israel. 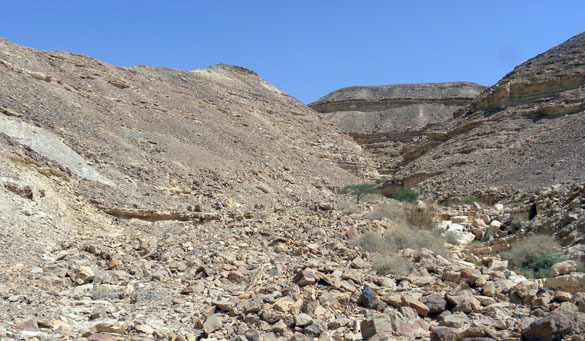 She gave us a most excellent tour of the Mishash (pronounced ME-shawsh) Formation (Campanian, Upper Cretaceous) in the Wadi Ashosh region (shown above) near Zuqim and Tsofar in the Negev Desert. We talked much about the fossil fauna, particularly the trace fossils in soft and hard substrates. There could be many future Wooster Independent Study projects in this formation, especially here where it is so diverse. As seen above, much of the Mishash Formation consists of bands of chert. 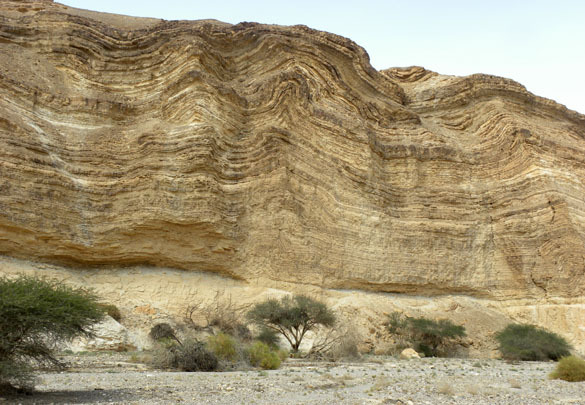 The folds are syndepositional (formed at the time of deposition) as part of the Syrian Arc deformation. This makes for some very interesting local stratigraphy and depositonal patterns. 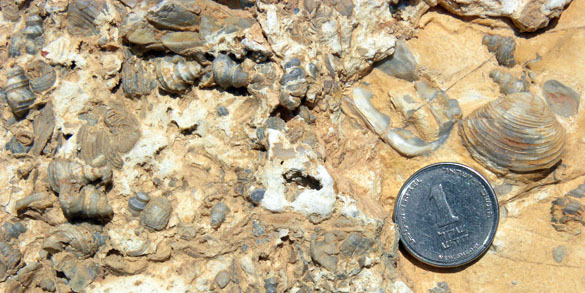 The Mishash Formation has exquisite fossil shell beds, often silicified (replaced with silica). Above you can see gastropods and bivalves. An old Cretaceous friend, the ammonite Baculites, is used to sort out the biostratigraphy of the Mishash. They are identified by the style of ribs they have on the outside of the conch. 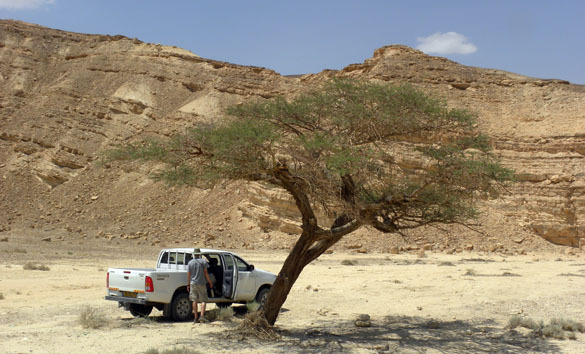 Like everywhere else in the Negev Desert, shade is a bonus. We always appreciate the acacia trees, even if their shade is not so complete. 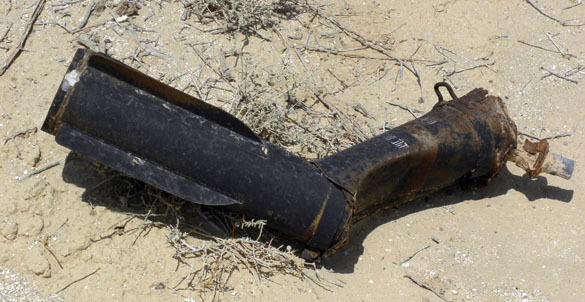 Will is standing here next to the Geological Survey of Israel vehicle. 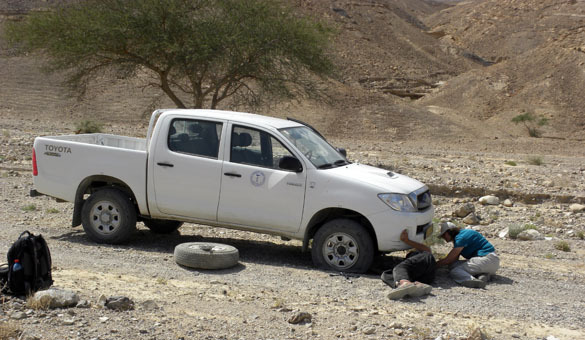 Shlomo, an old friend and the driver, gave us quite the off-road adventure. Many people pay for such tours! Flat tire at N30.54352°, E35.14007°. Near miss (if we had been eating lunch here, say, 15 years ago).